The pairing of two amazing texts with a charming new melody creates a pleasing effect that epitomizes the gentle message of Psalm 23. The chorus of “O How I Love Jesus” crowns the verses with the familiar and acts as a spotlight to the true meaning of this winsome anthem. The original tune that opens this piece is masterful and so endearing. look inside My Loving Shepherd Composed by Michael Ware. Shawnee Sacred. Anthem, Christ the Good Shepherd, General Worship, Sacred. Octavo. 12 pages. Published by Shawnee Press (HL.35030602). The choral octavo is published by Shawnee Press/Hal Leonard. 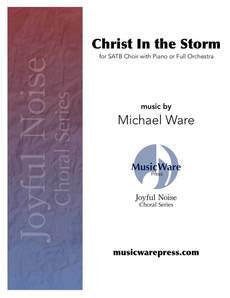 Orchestration is licensed and available through MusicWare Press.